75700WH is rated 3.5 out of 5 by 27. Rated 5 out of 5 by TOAHA from Love it Makes life easier as I use it to clean many items not just take a shower. Rated 5 out of 5 by deltaforce from Backed by a good company. Hassle free warranty. Great customer service. Rated 1 out of 5 by Harry from Dripping on all settings! Unit does not lock into the functions properly and causes a continuous dripping. When you turn the head for any function it does not click into place. Rated 3 out of 5 by Sissy93 from Tapered end of hose cracked while installing I love Delta products but this one seems cheaply made. I am a 70-year-old female with some arthritis in my hands but yet when I tightened the tapered end of the hose to the hand shower piece (by hand) it broke. Luckily I had another hose from another shower head and was able to substitute. Also the hose was very stiff and hard to get it to lay down properly. I was glad I had the other hose. I like how the shower head works and look forward to using it. Rated 1 out of 5 by grpuzojr from The problems continued I purchased this hand shower approximately 3 months ago and have had nothing but problems. Initially, the unit leaked heavily immediately after installation. After I removed the unit I discovered the washer did not seat properly during the installation. I reseated the washer, reinstalled the unit and the leaking stopped, for a while. Next the unit developed a constant drip. I was unable to stop the unit from dripping. Finally, while I was taking a shower the water pressure caused the flexible hose to disconnect from the bottom of the handheld wand. This left me holding the handheld while the hose was shooting water at my feet. All in all I don't think this product is very well made and I would advise anybody that is considering purchasing this product to keep looking. Rated 3 out of 5 by Sportypage from Worked well for 2 weeks I installed this product two weeks ago per the instructions. There were no tools used and everything was hand tightened per the instructions. Yesterday it started to leak. I took it apart and found that the plastic ring has cracked causing the leaks. I have put it back together and have gotten it to stop leaking for now. I have purchased Delta products in the past and have never had a problem with them. I am having a difficult time finding a replacement part. 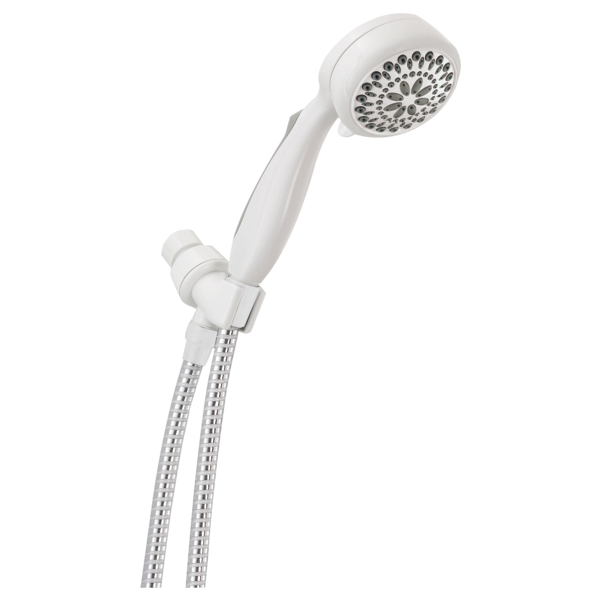 Rated 5 out of 5 by Gman from Very good product I am very pleased with the hand shower at this point. I will see how it works with more time and see how the life affects it. Rated 5 out of 5 by Mootsie39 from Excellent hand spray My husband & I are extremely pleased with our purchase of this hand spray. It was very easy to install & we love the different spray settings. I also wanted a hand spray to use when cleaning the tile surrounding the shower area & it works great. 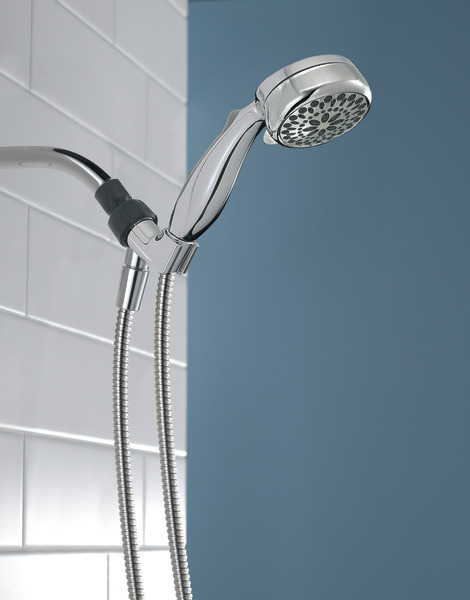 The shower head is easy to remove after showering to spray down the walls to remove soap scum & then return to the holder. The appearance looks really nice. 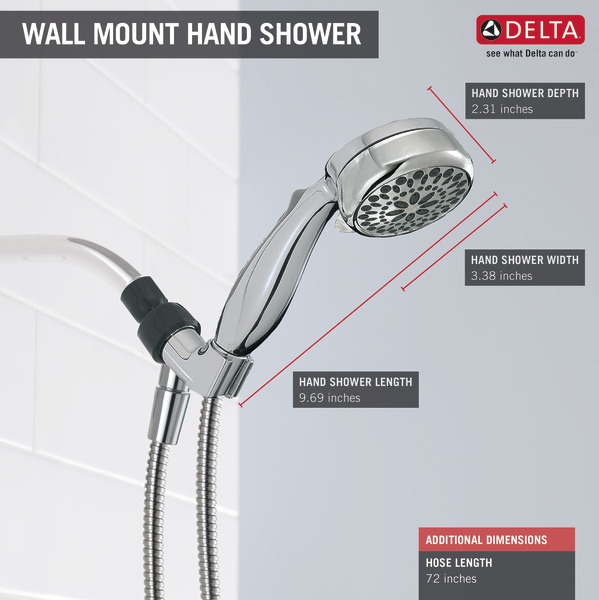 We are long-time Delta purchasers & didn't hesitate when we found this model. The brand always holds up really well. Happy Campers! Can this model (75700WH) be wall mounted? Which end of shower hose is which? I can't tell which end of the shower hose to attach to the hand shower or the shower arm outlet. The instructions I received with my hand shower do not match the ones on this website. The website installation instructions say that I must attach the ridged nut end of the shower hose to the shower arm mount outlet so the vacuum breaker works. The tapered end of the hose must attach to the hand shower, and there is supposed to be a yellow sticker on the tapered end. The print instructions do not say anything about a vacuum breaker, except to call and ask about it, but mention the tapered end and the ridged nut (but do not show them in the diagrams). But each end of the hose looks exactly the same-smooth outside with threads on the inside and a black washer in each end. There was no yellow sticker on either end. Neither end is ridged or tapered on the outside. How do I know which end is which? If there is a vacuum breaker in the hose, how I do I know it's working properly if I can't tell which end it's in? As there was no yellow sticker and the two ends of the hose appeared identical to me, I randomly attached one end to the hand shower and the other to the shower arm outlet. Everything is working fine, so I'm not sure whether I lucked out in the coin flip or if it really doesn't matter. 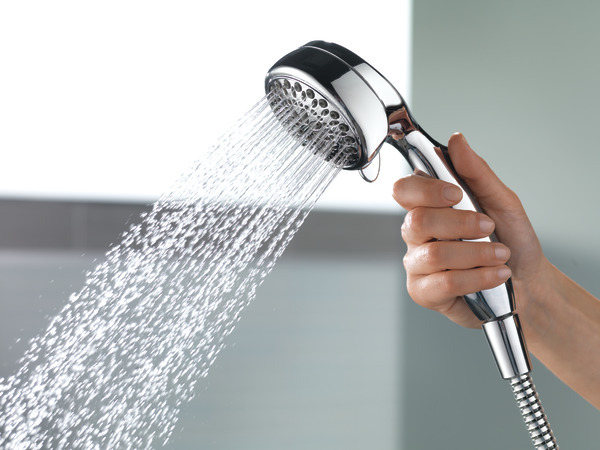 Is this a low flow shower-head? 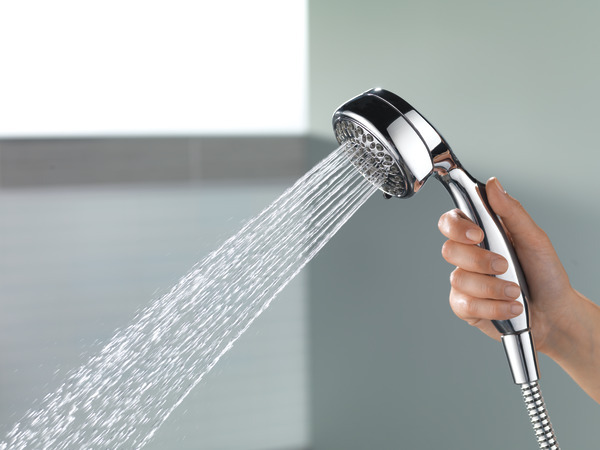 Is this shower-head designed to conserve water? Thank you for your question. 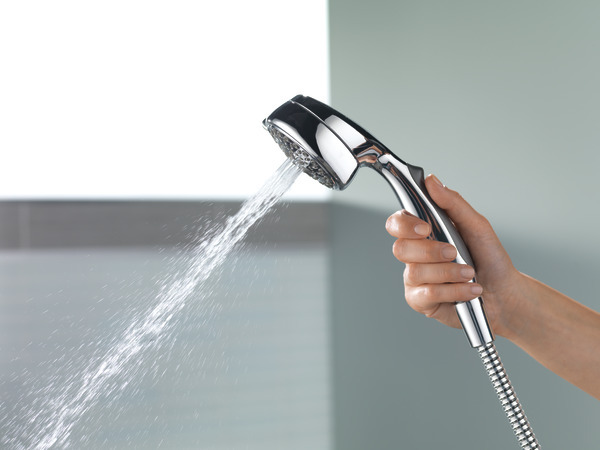 Delta Faucet model # 75700 has flow output of 2.5 gpm at 80 psi. 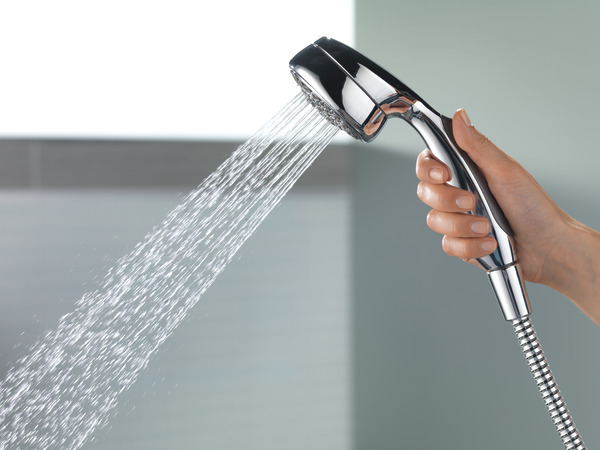 It is not considered to be a low-flow showerhead. How do I disassemble this shower head to clean out mineral deposits? I need to know if the hose will fit a male M22 thread adaptor. The water flow pressure is low. How can I increase it? Where is the flow restrictor in the unit? Can I remove it? I did not have this issue with the older unit.